The gyms of America need a status update. Active programs for children will help the nation return to good health. Try speed, try strength; be better, pound for pound. Special Offers: Boot camps, youth boxing, Don Beebe's House of Speed, athletic turf, cardio equipment, free weights, cable machines, TRX, heavy bags, etc. People need to exercise, and there are so many great ways to get it done that we may never get to fully highlight each unique procession. Here, in small-town Illinois, you find Pound 4 Pound Fitness, an elite training center focused on helping the entire family. You can box, wrestle, lift and sprint on their field turf. They keep the cost down and the intensity up. Yes, fitness is multinational, with shipping lanes from Boise to Bangladesh, but fitness also must exist. in small communities. If you want to take good health global, you should first take a look around the corner. I have always wanted to be in the fitness industry. I began my training career as an athletic performance specialist for Don Beebe's House of Speed. During this time, House of Speed allowed me to train while pursuing a military career. Being an active member of the military, I used my deployment earnings to jumpstart my fitness career and pursue my dream of one day opening my own facility. I started my own company, DeKing's Pound 4 Pound Training, Inc., and rented out space at local gyms. I was personal training and instructing boxing classes when Ryan Darby came to one of the classes. We started training together and quickly became great friends through our mutual passion for fitness. We started promoting boot camps and boxing classes and decided to become business partners. With my background in the fitness industry and Ryan's background in the marketing industry, we came up with a business plan. This led us to purchase our own training facility, and Pound 4 Pound Fitness was created. 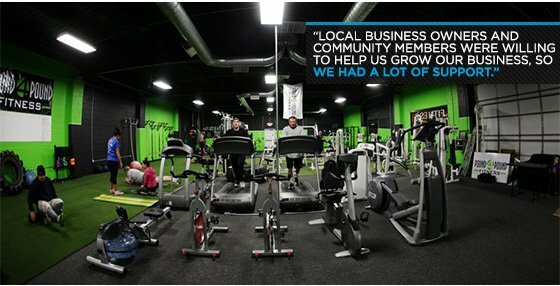 We purchased fitness equipment from local gyms and networked to as many people as possible within the fitness community. Spending long hours in the gym, sometimes up to 15-plus hours each day, helped us to build our brand of fitness. Elburn, Illinois, is a small town, so everyone in the community was excited about our gym opening. Local business owners and community members were willing to help us grow our business, so we had a lot of support. Our bold colors stand out and draw a lot of attention. The colors are exciting and stimulating, and create a vibrant environment. People are motivated to work out as soon as they walk in. As well as our unique training services, we offer general gym memberships, personal training, boxing and youth boxing classes, boot camps, and Don Beebe's House of Speed athletic performance classes. We do not simply cater to just one demographic; we attract all fitness levels. Fitness levels include competition-level athletes, to the average gym member looking for a different experience than they would find at a typical corporate facility. 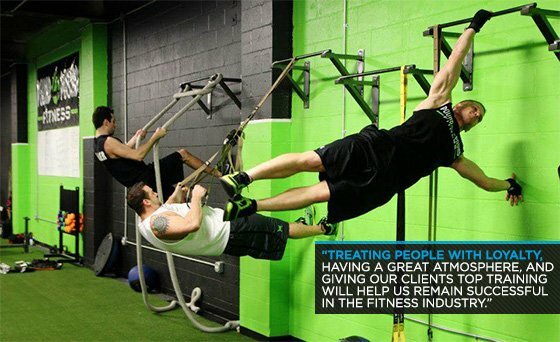 What inspires people to train at you facility? Our passion for fitness and our desire to help people make a difference in their lives inspires people to train at our facility. Because we love what we do, our environment has a fun, positive, and upbeat feel. Our clients genuinely love being a part of the Pound 4 Pound brand of fitness. We have three top trainers who have helped us build Pound 4 Pound Fitness: Nick Fatigato, Ryan Irving, and Danny DeKing. Our versatility in training services allows us to create unique fitness programs for our clients. 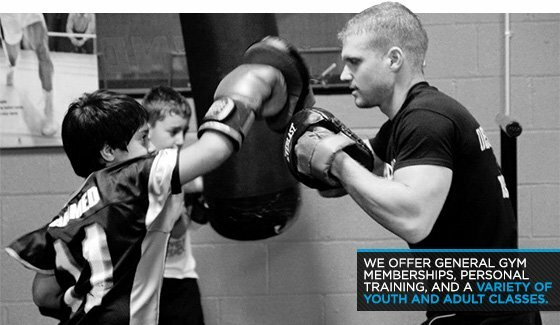 We offer general gym memberships, personal training, boxing and youth boxing classes, boot camps, and Don Beebe's House of Speed athletic performance classes. One of our most notable members is Casey Crosby (Detroit Tigers pitcher). Being located in a small town is tough. We have a great location with a lot of traffic but we still fight with the small town numbers. Our unique facility makes us competitive. In the oversaturated market of fitness companies, we had to create the ultimate fitness experience for our clients. There are few gyms that are open 24/7 that include the amenities we offer, along with specialty training services. We have a lot of open space for different types of fitness classes. We spent a lot of time trying to create our own brand of fitness, which helps separate us from our competition. We have been able to remain so successful because we are always reminded of where we came from. Humble beginnings created a specific path for Pound 4 Pound Fitness and we plan to stay on that course. Since we built our brand from the ground up, we understand what it took to get us where we are today. We are disciplined and always fight for more. Staying on this path is vital. Treating people with loyalty, having a great atmosphere, and giving our clients top training will help us remain successful in the fitness industry. We sponsor many organizations, but one of the biggest is the Elburn Lions Club. They provide us with many opportunities to help various charities, volunteer services, and have a direct connection with our community and surrounding area. Most of our donations or sponsorships revolve around fitness, such as 5K races or local athletic teams. Many of these contribute to the fight against breast cancer and childhood obesity; we assist memorial programs, and club teams. What's with all the green? From the beginning, Ryan and I wanted to give our members something to remember. We wanted them to experience something that they had never gotten from their previous fitness facilities. It didn't take long for us to come up with the colors. The colors and the gym itself had to be relatable, marketable, bring energy to our space, and look distinctive. Many of our members have said our gym looks like a Monster can, which always makes us laugh. How has the emergence of CrossFit influenced your gym? Special equipment? Different clientele? 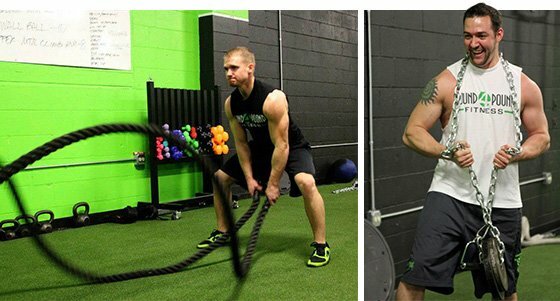 Although we have a similar look to CrossFit gyms, we focus more on other styles of training. We try to provide our members and clients with a wide variety of training options. CrossFit has influenced our decisions on what equipment would be most beneficial to our members as we continue to grow. Many of our members come from a CrossFit background or are interested in trying that style of fitness, so we keep that in mind when making equipment purchases. What is the meaning behind the name: Pound 4 Pound Fitness? Ryan and I have always been big boxing/MMA fans and I have competed for some time. The term Pound 4 Pound is used throughout the fight world to describe the best fighters in their respective weight classes. We wanted to use this to describe our gym as being the best around. Also, we thought losing weight "Pound 4 Pound" was a clever alternative for future advertising. It is meant to relate to all levels of fitness. You open your gym to people of all ages. How important is youth fitness to your overall goals? Youth fitness is vital to the success of our gym. With the population becoming more deconditioned and obese, we feel we have an obligation to our youth to provide alternative ways of training. Our youth boxing programs and athletic performance classes are tailored to our younger members. Today's youth is tomorrow's future and these children have the right to understand the importance of taking care of their bodies. We understand the importance of providing them with that knowledge. Tell us more about Don Beebe's House of Speed? Founded by retired NFL star Don Beebe in 1998, House of Speed has trained individuals of all ages and skill to perform better by enhancing their speed and character. Don had a nine-year NFL career, during which he played on six Super Bowl teams. Perhaps he is best remembered for catching Leon Lett from behind after spotting him a 35-yard headstart during Super Bowl XXVII, one of the greatest character displays in league history. Don retired with some of the fastest 40-yard dash clockings ever recorded (4.21 seconds). Don has passed down his legacy to House of Speed, which is devoted to improving athletic performance and character for participants in all sports. House of Speed offers private training, weekly clinics, small group training, and speed camps for all ages and levels, as well as combine training for high school, college, and professional athletes. Their reputation has reached the highest level, and they continue to strive for new heights with their state-of-the-art training programs. Don Beebe's House of Speed is one of the best athletic training brands, and Pound 4 Pound Fitness wanted to branch out with our training services and go into business with them. Our location serves as a training site for all House of Speed athletes. What does that large field of athletic turf add to your training options? The open space on the turf is popular with our trainers, and they use every inch of it. The majority of our boot camps, House of Speed classes, and our personal training sessions are done on the turf. Our members love it because of the low impact feeling it provides during high impact exercises. We want to thank BodyBuilding.com for providing us with this opportunity and awarding us with such a great honor within the fitness community!